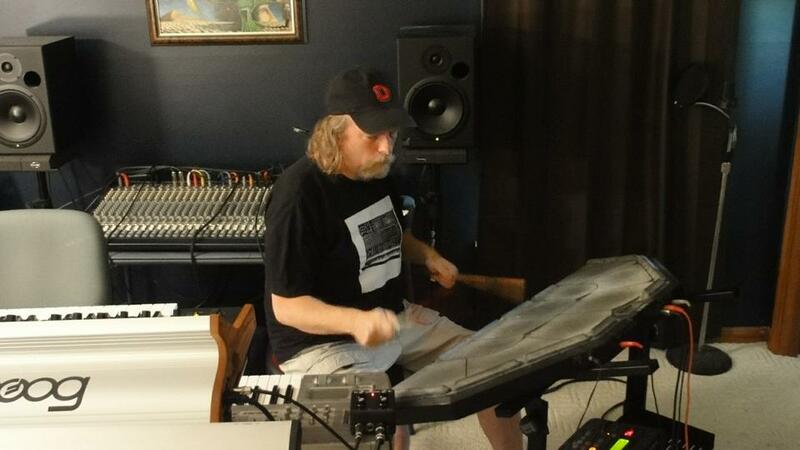 Church of Hed began life as a side project for Quarkspace founding member/drummer/synths maestro Paul Williams during slow periods for his at that time “Mothership” band. The first, self-titled Church of Hed album came out in 2002, followed by the Route 66 themed Rivers of Asphalt in 2011. 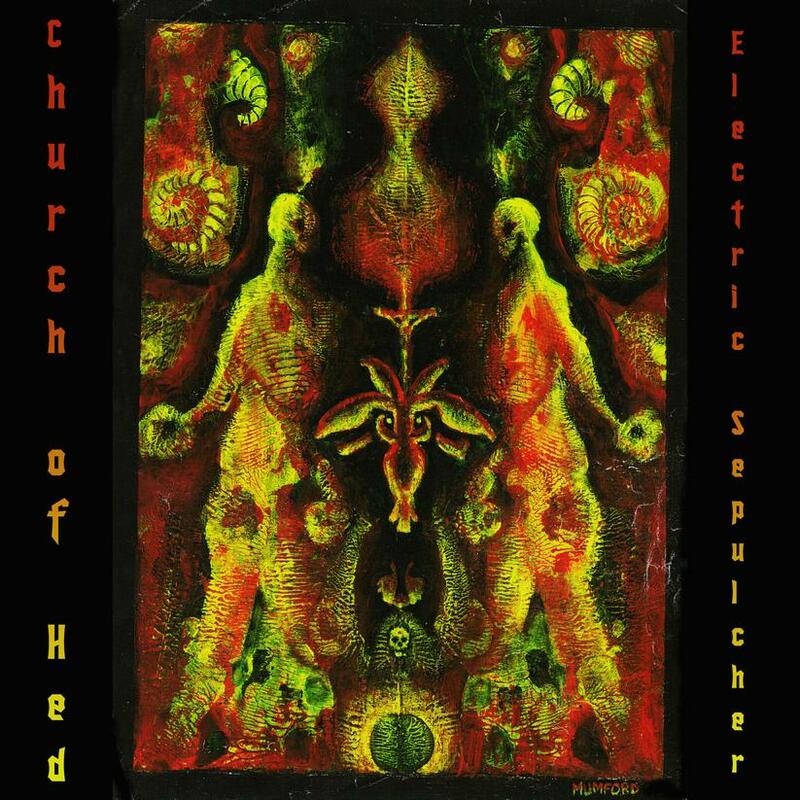 And now we have the brand new Church of Hed release – Electric Sepulcher. As Aural Innovations comes to the close of our eighteenth year of publication I have to admit that Electric Sepulcher has me feeling reflective and sentimental. The writing, printing and stapling in my home of the original hard copy zine was inspired by conversations with Paul in his former Oxley Road apartment here in Columbus, Ohio. 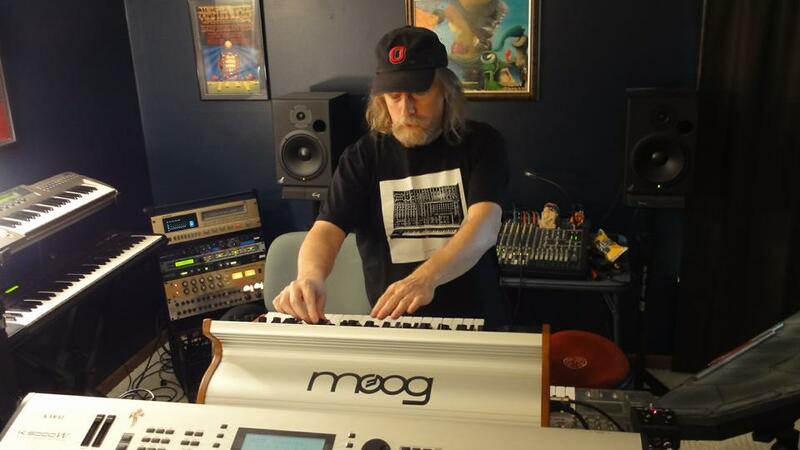 Quarkspace was in high gear in those years, playing frequent live shows in Columbus and were a regular presence at the Strange Daze Space Rock Festivals. My fondest Quarkspace live performance memory was when they played a killer show of about 4 hours straight at the Thirsty Ear Tavern without ever taking a break and ended up blowing out the bar’s sound system. They were not invited back. Add to that the Electric Sepulcher cover art by Christian Mumford, the first ever contributor to Aural Innovations, who’s amazing art work graced nearly every printed issue of the mag and I’m feeling pretty damn good. I’d say that absolutely nails the music on Electric Sepulcher. The album is a luscious instrumental journey that consists of quirky spaced out electronica, Space-Prog symphonics, sci-fi soundtrack and electro grooves. Paul excels at seamlessly blending disparate styles and influences, and the thematic development throughout the set is among his best yet. The brief introductory Eternal 2 is a surreal mash up of quirky melodic looped, and backward efx’d synths and keys, which leads into the first full song, The Moebius Wave. The commanding piano melody recalls Quarkspace and is accompanied by freaky alien effects which are part of an overall darkly intense orchestral Space-Prog theme. The title track features trademark Church of Hed electronic rhythmic and melodic quirkiness, which sounds very cool when combined with the eerie sci-fi ooh-wee-ooh effects, Mellotronic waves, and Jazz-Prog electric piano melody. Listen close and you’ll hear what seems like a strange array of stylistic components that Paul brings together into a cool grooving Space-Prog-Jazz whole. Glacial is a morphing of 1960s sci-fi TV show theme, darkly rumbling electronica and high intensity Prog. East Of Christopher features more rug cutting electronic quirkiness and sci-fi theme vibes. Godspeed You Alien Dingo is the 10 minute epic of the set and where Paul’s thematic development skills really shine. It kicks off with a few minutes of meteor shower space synths and cosmic Mellotron wave, before transitioning to a combination of syncopated electronic pattern, alien effects, and a beautiful dual combination of gently pleasant piano and spaced out synth melody. After a while the piano becomes more darkly intense, while effects flitter about and we set into a groove that recalls Berlin School Kosmiche, though the piano continues to lead the way. After settling in for a peaceful landing we launch headlong into the hurly burly of the dance floor space raving House Tron. Trace the Rubycon is a meditative combination of Berlin School quirk and beautifully tinkling melody, but also Quarkspace styled intensity. Finally, Eternal 1 closes the set with a blend of electronica, effects and ethereal voice samples. Aural Innovations (AI): It’s going to be hard to ask about the new album without also talking about Quarkspace so I won’t try to separate them. You said you feel this is your most focused Church of Hed album to date because of the lack of distraction due to Quarkspace either retiring or going on hiatus last year. The last Quarkspace album – Spacefolds 12 – came out in 2013. So let’s start with Quarkspace… give us the skinny since Spacefolds 12. Paul Williams (PW): Quarkspace got really close to completing All These Suns — our first real studio album since Drop in 2001. We were about two-thirds finished with the recording and all that would follow was mixing and mastering — a few months of work. Jay and I talked to a music store owner here in Bourbon country about hosting an album release party and he was honored to be asked after researching our backstory. He was going to have the event catered, provide a light show, and stream the video over the Internet. Jay and I checked his place out (the first time for Jay, since I’ve been there multiple times) and we discussed PA considerations and everything was a go — this would have happened in the Fall of 2014. I publicized the event (in pencil) on the Quarkspace Facebook page and interest was building and plans were being made. After that weekend though, Jay stopped returning my phone calls and the same with Darren. I have no idea why, but suspect the effort required in putting together a good live show as well as finishing the album seemed too daunting for them. We’ve had no contact since then. I left messages to both this May, which would have been a year since our last meeting, but to no avail. Neither are on the Internet. Not returning phone calls is a huge pet peeve of mine, but oh well, we’ll always be musical brothers. They are always welcome to stop by and jam. At that point, I decided to do a new solo album, which became Electric Sepulcher. I was working on the second Rivers of Asphalt album (more on that later), but was fired up to work on more immediate music. I had been writing material (some with Jay) for a new Quarkspace album after All These Suns, which had been worked on now for eight years and whose centerpiece song (the title track) was something from our late 90s live repertoire. I did have a few in the spacerock community contact me about helping to finish All These Suns after hearing about the situation, but I really have no interest in doing Quarkspace without Jay, Darren, and Chet. In fact, in hasn’t really been the same since Chet moved to California in 2009. We really should have called it quits then or even in 2004 after Node in Peril came out. The Spacefolds releases have been a few years behind the actual jam sessions since 2001. Spacefolds 12 includes material from 2008-2009. There is enough material for a few more in the Spacefolds series, but at this point, I have no interest in the archival, mixing, and mastering work necessary for their release. Also these recent jams don’t have Chet, and some of them would require overdubs from Darren, since he only was present for around half of our get togethers. At this point, any new Quarkspace release — barring something unexpected — would be of a retrospective nature — maybe a two or three-disc overview (which would include some of the tracks from All These Suns) and a two-disc Best of the Spacefolds release? I have zero interest in working on anything like that right now, but if any other record label is interested in releasing them, I’d listen. Short of that, maybe release them on Bandcamp? I have no desire to use Eternity’s Jest’s limited resources for this kind of project. I want to keep looking forward musically, as always, and am writing and producing more stuff than ever — even compared to our most productive period in the late 90s. Chet and I are in regular contact. In fact, I had to ask him last week for recommendations on strings for Angela’s lap steel guitar, since I broke one when trying to tune it. He continues to care about Quarkspace’s legacy, for lack of a better word. I honestly think the others don’t. It was always more of a social, “let’s get together to jam” type of happening for them. There’s nothing wrong with that. It was fun while it lasted, but those times are gone — especially without Chet. Jay never was really into spacerock per se, being more of a classic rock and 70s prog fan (he’d be happiest singing and playing in a Beatles cover band); Darren as well. Jay at times expressed frustration about only doing improv when we got together, so we were writing more (I’ve always felt the same way). The irony being that composition takes a lot more time and effort than improv, and in the end we were unable to work as hard as we needed to. AI: I believe this is the first fully solo album you’ve done? No guests at all. Was that a decision or just the way things worked out? Yes, no guests this time out. It was a bit of a conscious decision, but the circumstances of being in the middle of nowhere also limit who are able to show up for guest work. AI: If I go back 18 years to the earliest Aural Innovations days, you and I used to get into some interesting “genre” discussions… Space Rock – Prog. Having said that, I love the Church of Hed description on your web site: “21st Century Berlin School meets spacerock and prog”. Because throughout Electric Sepulcher I hear all that and more. PW: Yeah, that’s a pretty accurate description. I’ve been really listening to tons of music over the past two years, even more so than typical — anything from newer artists like Flying Lotus to older albums from Gram Parsons. I’ve been bingeing on Eno, Tangerine Dream, Mahler, Curtis Mayfield, Camper Van Beethoven, etc. as well. Really, there are too many to mention. All of it inspires me in its own way. Genre is more of a marketing term anyway! AI: Let’s talk about all the tracks on Electric Sepulcher, starting with the two Eternals which open and close the set. I like the quirky spaced out electronica on Eternal 2 and Eternal 1 is a tasty spaced out and melodic finale with cool voice samples. PW: These two are based on the same loop I originally wrote for use in another project that never got off the ground. Eternal 2 is the same loop as Eternal 1 but played backwards. Found some voice samples and added some freaky sounds and there you go. Eternal 2 features my Kawai K4 and Moog Sub 37 at the end — my oldest and newest synths in the arsenal. The public domain voice samples add to the vibe. I kept going back and forth about each track’s placement at the front or end of the album, thus “2” being first, and “1” being last. AI: The Moebius Wave has a symphonic, dark Quarkspace-ish vibe, but also electro grooves and spaced out electronica. PW: The Moebius Wave is an older “house” loop with loads of trippy sonic work. One day last year I improvised what became the piano melody on the final version. The original was done on my Korg Z1, but I had to relearn it on the weighted 88-key synth I use today — it’s in one of those “hard” modes with a lot of “black” keys. Since the improvised part was in half-time compared to the beat, I added some drumming on the slower beat; it’s essentially a mashup between a house beat and a slow jam — for worse or better! The Waldorf Streichfett string synth and Moog Sub 37 add to the fun. This track is dedicated to Dieter Moebius. AI: Electric Sepulcher features classic “Paul” quirky electronica, sci-fi soundtrack, jazzy grooving Prog, and dark sympho atmospherics. PW: The title track of the album is currently my favorite CoH piece. I wrote the backing loop about three years ago early on New Years Day. Quarkspace jammed on versions of it, but it never got very far. I spent most of the last year developing melodies and other parts to make it shine. The live drum part wasn’t planned, I just improvised one day towards the end of recording and liked it. I really focused on melody writing on this album compared to earlier work — it is a fun and rewarding exercise. AI: I like the blend of sci-fi soundtrack, dark mellotronic Prog, alien electronica, bits of electro and Van Der Graaf Generator vibe on Glacial. The electro bass pulse feels like a rumbling tank march and it has a super cool high intensity finale. PW: Glacial features a loop written during a trip to Lake Erie’s Kelleys Island. It is another piece where the final melody composition was vital. This is kind of an Eno-influenced work to my ears, but you correctly notice the Guy Evans Cowbell Beat (TM) in the weirdo bridge section. AI: East of Christopher has a nice bouncy, spirited, rythmically varied Space-Prog feel. PW: This track features the oldest beat on the album. I am pretty sure I wrote it when we stayed in Bedford PA on the way out to playing in Philadelphia in 2003. Quarkspace had jammed on it multiple times and it never quite worked. I was really struggling with a melody for this track and was almost going to cut it. The first song from Neu ’75 shuffled up that weekend on my iPod and boom — I was inspired. The Moog Sub 37’s LFO sounds perfect on the melody, so a tip of the hat to Herr Rother et al. This track is dedicated to Chris Squire. I originally called it East of Nimoy for Leonard (it reminds me of the In Search Of theme), but was mixing it on a Sunday morning a few months ago when I took a break, checked Facebook and saw that Chris Squire died. Since the bass line on it always reminded me of Squire (or Chet channeling Squire), I changed its name. Chris was my first rock star “idol” in high school; I had his page from the Yessongs book on my bedroom wall. Never became a bassist though — yet. AI: Godspeed You Alien Dingo is the album’s Space-Prog-Electronica-Berlin School epic. I love the thematic variation and transitions. Some of it reminds me of Quarkspace, but with the Church of Hed electronia injection. Well… I guess any time I hear piano here it’s going to remind me of Quarkspace. The drum track took me a few months of rehearsal to get used to playing the same beat without variation for 4 minutes straight. Over the years, my keyboard playing has really corrupted any traditional drumming style I used to possess. Obviously, this track is dedicated to Daevid Allen. AI: House Tron screams Space Rave! PW: Yeah, this one is my nudge and wink to Crimson’s Thela Hun Gingeet or however it’s spelled. The loop is from around 7-8 years ago; it was too weird for Quarkspace. I used to call it Adrian’s House Tron, but House Tron fit better. Once again, the drum track took months of rehearsal to (almost) get it right. My arms almost fell off. AI: I like the dark Quarkspace piano, tinkling melody and sequenced pattern combo on Trace the Rubycon. It’s got an overall Space-Prog feel with a pleasantly haunting melody and soundtrack feel at times. PW: This is a newer loop and composition. In fact, Quarkspace did a pretty decent take on an earlier version of this. It uses the Korg iPolysix iPad app for the backing beat and a whole host of my synths throughout. I stole a motif from Rivers of Asphalt 2 to add the second chord progression. 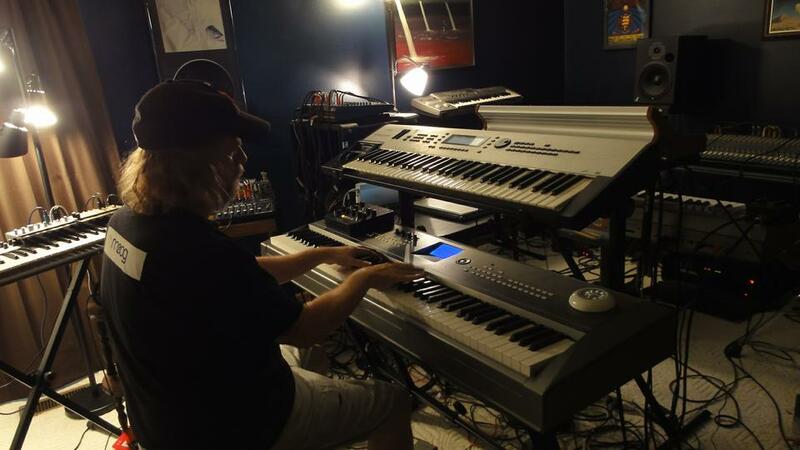 It is dedicated to Edgar Froese. AI: How did you come up with the title Electric Sepulcher? Anything to do with the four in-memoriams I see in the CD notes for Daevid Allen, Edgar Froese, Dieter Moebius and Chris Squire? PW: I just thought it was a cool title that popped in my head one day and I knew Christian Mumford would have some great artwork that complemented it. So many of my musical heroes kept dying during the final recording and mixing it was starting to freak me out a bit. I had to get it done! AI: Quarkspace had, at one time, been a Columbus (Ohio) band. Now I don’t think any of you, including yourself, live here. Have you been happy with your move to Kentucky? After I visited the Buffalo Trace distillery last year you said you lived near there so I’m curious if you live in a rural area? PW: Yes, it is quite rural where we live. It is very peaceful and when combined with all the new (and new to me) music I am discovering and listening to here, it is definitely inspiring. Dave Wexler and Stan Lyon still live in Columbus as far as I know, but the rest of us are all gone. End of an era, for sure. AI: I’m interested in the continually evolving nature of formats and distribution. I believe your CDs are available directly from you and through CDBaby, and digital versions available through all the major services? PW: Yes, I stopped dealing with distributors — other than CD Baby — for the most part in 2001. It was too much work to deal with, especially when we didn’t get paid. I actually got flack from one distro for releasing Drop for free. Matt Howarth handled the wholesaling of Node in Peril as part of our agreement on that project, and Quarkspace have only released Spacefolds albums since then, so it wasn’t a big issue. AI: Are you selling more CDs or digital? PW: I’d estimate we sell 85-90 percent digitally these days. I only printed up CDs for the last two Church of Hed albums for promotional purposes — and then I didn’t even promote the first Rivers of Asphalt! I did so much more promotional work back in the day; these days I’m happiest to just do the music and mostly let the people discover it. We do get folks (the smart ones) taking advantage of our “Buy One Get Four Free” deal on our website. Streaming is cutting into the revenue for all musicians. We do get thousands of streams a month, so I assume people are still discovering the music — why would folks who already own the CD or download stream from a service? The entire Quarkspace and Church of Hed catalogs get streamed regularly according to the data in our reports — even National Steam! Nonetheless — I have no plans to stop recording music (mostly under the Church of Hed moniker) and am pleasantly surprised we continue to do as well as we do. There’s too much cool stuff still yet to come! AI: I see on your web site you are continuing work on the sequel to Rivers of Asphalt. The “continuing” indicates you’ve already been working on it. Have you been working on this simultaneous with Electric Sepulcher? Will the sequel be the next Church of Hed album? Yes, Rivers of Asphalt was originally intended to be a double album — Route 66 and the Lincoln Highway. When it took so long to do the Route 66 album (2003-2010), with all its stops and starts, I decided to do the Lincoln Highway section as a second release. I was working on it regularly up until the Great Quarkspace Flake Out of 2014, when I focused efforts on what became Electric Sepulcher, while still playing some of the motifs and parts when I practice. It probably won’t be the next Church of Hed album, since it will take a couple of years to finish and guests will be involved. Greg Kozlowski and I have talked about him appearing on this one, plus I have other ideas for guests in mind. AI: The previous question was actually taken from the second part of a sentence on your web site which reads: “We are also looking forward to starting on new albums”, and the Rivers of Asphalt sequel was an “AND”. What are these other new albums? PW: I am currently working on The Autumn Shrine EP which will be released around Thanksgiving. It features a new composition, a freaky improv, and two pieces originally slotted for Electric Sepulcher that I cut, not for quality’s sake, but to better balance that album. I have always been jealous of Stereolab simultaneously releasing great albums and EPs, so I hope to follow that model moving forward. I expect to release other albums that don’t follow concepts like Rivers of Asphalt. I also have plans for a Spacefolds like series of primarily improv material. Whether that ends up following a magazine release cycle like Spacefolds or the work gets folded (pun?) into EPs and other albums remains to be seen. Unfortunately, I have no plans for live performance at this time. There are simply too many parts on a Church of Hed piece to cover by one person. AI: Any other news or upcoming activities you care to share? PW: Folks who are interested in music gear, especially of the synth variety, should check out my TabMuse website (CLICK HERE). I don’t publish enough on it, since I am usually busy in the studio, but there are quite a few reviews and articles currently — including a couple by one Kev Ellis. Other than that, stay tuned to the Church of Hed website and our Facebook page for the latest. Someday I will redo Quarkspace’s website as well.